Hey, that tastes good! : Snow storm already? 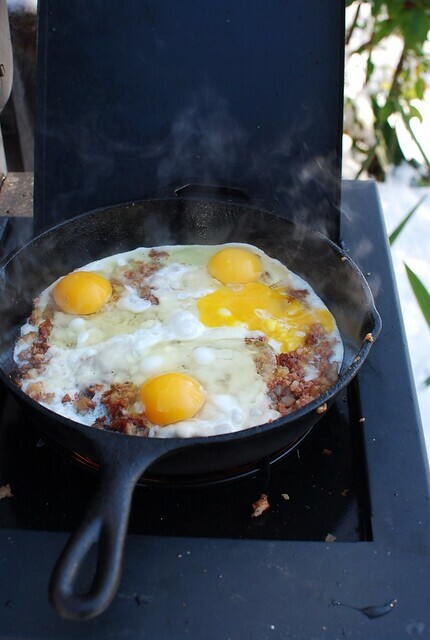 and corned beef hash with eggs and cheese recipe. Snow storm already? and corned beef hash with eggs and cheese recipe. HI you guys! I'm back from Europe, and all kinds of things have been happening. First, we came back from Europe which I will write about eventually, probably. In the meantime, you can look at photos here. Next, Alex got a big promotion at work. Hooray! He's the best. Then, we got this little monster in the photo above. Look how cute he is!! 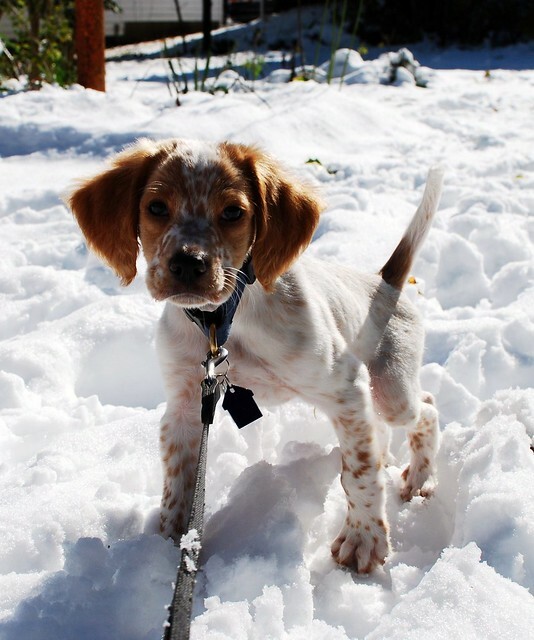 His name is Fritz and he is an English Setter puppy. We found him at a shelter in Beacon, NY and drove down on a whim and picked him out. Have you ever tried to pick out a puppy from a pile of them? It's hard. Also, if you're looking for an English Setter puppy, two of his brothers are left! Puppies are the best. I'm sure you heard, but we had a hell of a storm this past weekend. We got something like ten inches of snow, and lost power for three and a half (very cold) days. Luckily we were still working, so we had a few hours of warmth and light. It was pretty hard. And they cancelled Halloween!! I'm glad we bought a grill with a side burner when we picked ours out this summer, because it's saved us in both storms since we've moved in. 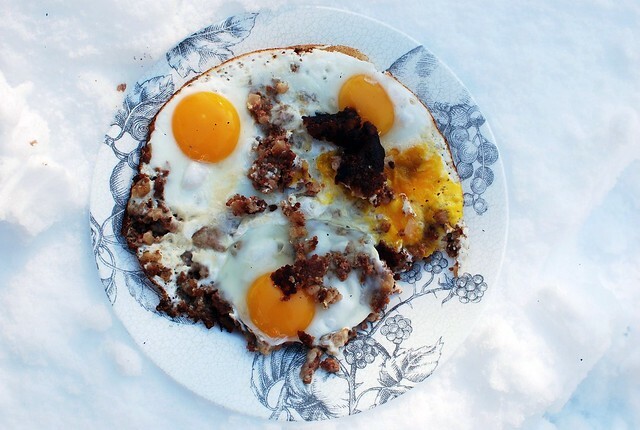 My favorite storm food is corned beef hash and eggs. This time I stuck in some american cheese, and it was one of those 'this might be the best thing I've ever eaten' meals. We were freezing, it was dark, and this was a spirit lifting meal. For coffee I always make cold brewed coffee when we don't have power. It may be cold (or, room temperature, which is cold) but at least it's delicious. I buy corned beef hash in a can for emergencies only, because it's super bad for you but nothing tastes as good when you're without power. Hormel brand is gluten free. Heat up your cast iron skillet on your grill, either on the side burner or on the grill itself. Plop in the corned beef hash, and spread around. Let it sit for a while, then stir it and flip it over. Next cover the top with cheese slices, and then break in your eggs. It's ok if one breaks. Let that sit until the whites are set, probably about ten minutes depending on how hot your grill is and how cold the air is. Remove from the pan and sprinkle with pepper, and maybe hot sauce. You shouldn't need salt because corned beef hash from a can is super salty. 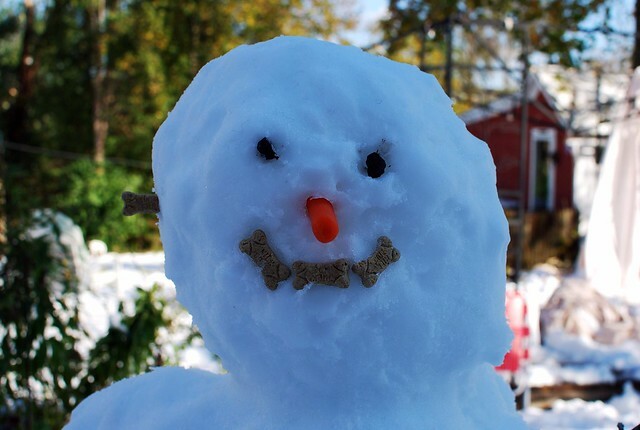 Now keep your fingers crossed your heat comes back on. Aww. Fritz is way too cute! That corned beef hash looks delicious. I buy the stuff in a can every now and then. It's pretty addictive (probably all the salt). Somehow I never thought of frying eggs with it. I'll have to wait for some day when Mike's not home because food like corned beef hash in a can absolutely disgusts him, but I'll have a tasty breakfast. Cute dog and your cornedbeef hash looks awesome. The corn beef and hash looks amazing!